Home » Posts Tagged "dental instruments"
You hear the word “dentist”—what does your mind conjure? Most people relate it with, “The Drill.” So you may recognize certain noises or sensations in a dental visit, but what’s actually being put in your mouth? Most tools of the trade will be visible to you from the dental chair. Since we often fear the unknown, why not learn to identify these tools often used by your Danbury dentist? Mirror, Mirror, on the…rod—this small, round mirror angled on the end of a metal stick allows the dentist to view the hidden side of teeth. 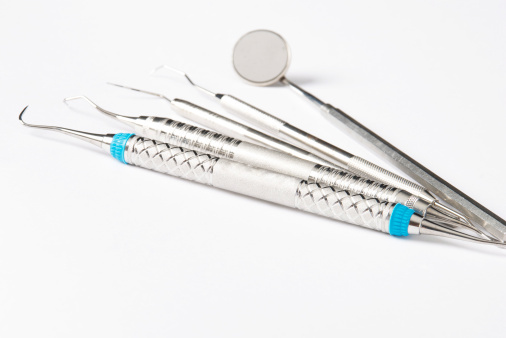 A little probe here, a little probe there—a sickle probe, also known as a dental explorer, is a metal stick with a thin, curved hook. You’ll notice the dentist touches the surface of your teeth with this tool to determine the amount of enamel, plaque, and tartar on a tooth and to test the tooth’s hardness. 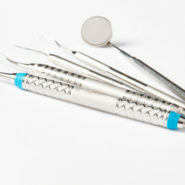 Periodontal probes look very similar to the sickle probe except the end is blunted. Its design enables a measuring of the amount of space between your gum tissue and tooth—signs of gum disease. The melodious drill—perhaps it’s the high pitch, but for some reason, most people unnecessarily dread the dental drill. Different drills are used for different things, such as filling cavities, repairing chips, smoothing teeth, or removing tooth decay. No wonder it feels like it’s always running! Cotton pliers—they look like small tongs with tapered points that bend at an angle. They’re used to handle cotton or other small items placed in or removed from the mouth. Isn’t that better than your dentist’s fingers? Excavation by spoon—really it’s another metal stick-type tool but designed with a tiny spoon-shaped end. Variations of this tool allow the dentist to remove different levels of softened decay or temporary fillings. “Spill in aisle 3”—your head is tilted back and there are dental instruments working in your mouth—don’t panic! The disposable saliva ejector provides a low amount of suction to remove saliva, blood, water, or debris during procedures. A little pinch—for procedures known to cause some pain, a numbing or freezing agent must be administered. Check out this brief, animated video by KirrilyRae and note the visual difference between a “regular” needle and a dental syringe. “I saw a blue light”– The material used in tooth repairs will not harden until exposed to the dental curing light. You may remember it as a “blue light” with an orange shield. Is it time for your bi-annual dental check-up or cleaning? Make that appointment today with Dr. Gerfen, your trusted Danbury dentist—and then congratulate yourself for knowing exactly how you came about having that dazzling smile! Share your guessimate—what dental tool uses wavelengths to reshape a person’s gum line?